We’d love your help. 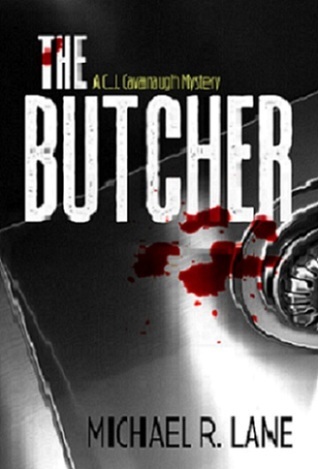 Let us know what’s wrong with this preview of The Butcher by Michael R. Lane. who have not only survived divorce but also thrived in its wake. Kylie encounters an alluring stranger who charms her into going home with him. The next day, Kylie Preston’s body is discovered in a stolen car, dissected and preserved in ice chests, the pieces wrapped in brown butcher’s paper secured with cellophane tape and twine. When Portland Homicide finds themselves at who have not only survived divorce but also thrived in its wake. Kylie encounters an alluring stranger who charms her into going home with him. The next day, Kylie Preston’s body is discovered in a stolen car, dissected and preserved in ice chests, the pieces wrapped in brown butcher’s paper secured with cellophane tape and twine. When Portland Homicide finds themselves at a dead end, Carl Wheaton, a dear friend and colleague of the deceased Vice-President of Acquisitions for Lunsford Insurance, implores C. J. Cavanaugh to investigate on behalf of his employer. Despite his misgivings about becoming involved in another murder case, C. J. cannot say no to his friend. As C. J. delves into the background of the murder victim in search of motives, he is disturbed by what he uncovers. Kylie Preston chaired a culture of unethical insurance practices that constructed many of the rungs on her ladder to success. Were Carl Wheaton and Lunsford Insurance aware of Kylie’s unethical practice of short-changing insurance claimants? If so, were they complicit in any way, or did they simply chose to look the other way? The answers could shatter the high regard C. J. held for their number one client and irreparably damage their hospitable relationship. Published August 2018 by Booklocker.com, Inc.
To ask other readers questions about The Butcher, please sign up. This is the third mystery in the C. J. Cavanaugh P.I. series, and my favorite to date. The non stop twists and turns will keep you reading far into the night. My passions for reading and creative writing inspired me to devour everything from contemporary novels to classical literature. As a high school student, I wrote poetry for my own enjoyment. That joy blossomed into a zeal that would not be contained. Composing poetry rippled into short fiction writing that led to the literary path of creating novels and screenplays. I have studied English Literatu My passions for reading and creative writing inspired me to devour everything from contemporary novels to classical literature. As a high school student, I wrote poetry for my own enjoyment. That joy blossomed into a zeal that would not be contained. Composing poetry rippled into short fiction writing that led to the literary path of creating novels and screenplays. I have studied English Literature and Creative Writing at Point Park College, Sonoma State University, and Portland State University. I have written creatively for more than three decades, and my poetry and short fiction have appeared in numerous literary publications such as Potluck Mag, Taj Mahal Review, Inwood Indiana (Ditch ‘Em), Crack The Spine, The Storyteller, African Voices Magazine, Spindrift and Aim Magazine. Emancipation, The Gem Connection and UFOs and God are three of my latest works of fiction. For more information regarding each explore their web pages right here on Goodreads.